Healthy Living by V | Offering guidance towards healthy living and self-discovery through yoga. Three of the greatest gifts I have received as an Ashtanga practitioner and Ashtanga teacher are these amazing human beings I am standing with here. I treasure each of them tremendously. It is Taylor Hunt who ultimately brought us all together and I am and will be forever grateful. Taylor Hunt is my teacher. Before Taylor, I had been practicing Ashtanga for years without ever understanding how powerful this practice could truly be. 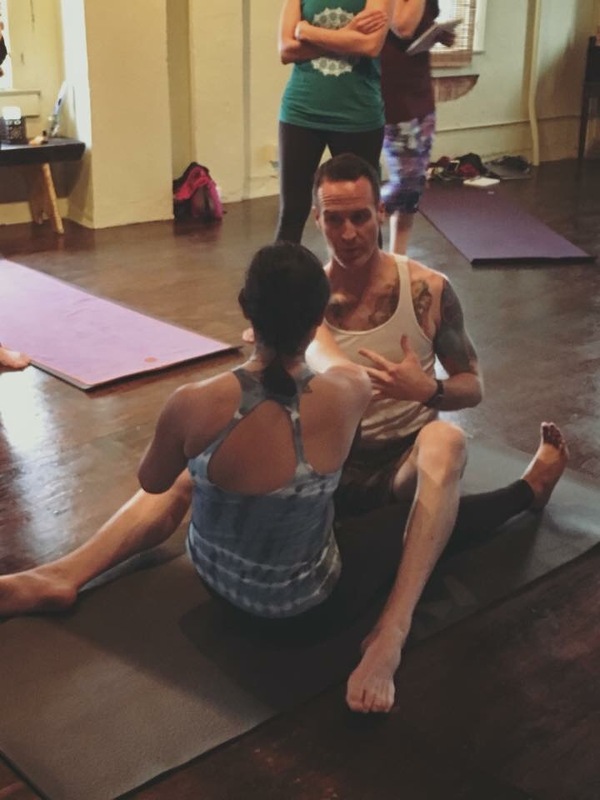 I loved practicing Ashtanga but it wasn’t until Taylor had me glimpse into my own potential that I was able to truly love myself within this practice. Here’s the thing…I stayed comfortable for years with my practice, not really understanding the method, not realizing the true purpose for what I was doing and why. I practiced just enough to feel good about being physical, gaining just enough strength to do what was fun, what felt good, and I skipped over the stuff that required real WORK…but I truly had NO idea that I was doing that, nor did I know why. And then a year and a half ago, Taylor finds his way into our town and turns everything upside down in the best way possible. Everything I had been doing was either wrong or misunderstood and I completely underestimated what this would mean for me from here on out. Since that first visit to San Antonio, I’ve been collecting my series of personal “Taylorisms” that I value so much and I carry with me through my practice as I continue to grow. The first was “Be careful how you talk to yourself” and this changed my life. I was almost shocked because I thought I was really good at being positive because I was good at teaching this to others but he called me out so big and stopped an entire workshop to address my subtle self-deprecation that the reality check I got was as real as they come. I took that next lesson and I applied it. I chose to dive in, to move forward and to “own it” as Taylor had told me I needed to if I was going to teach it. He’s right, and I do not teach anything I don’t work very hard at doing myself on a daily basis. With this work came a LOT of tears, a LOT of physical pain, a LOT of breaking down and breaking through beliefs I had about myself that were and are simply NOT true. With this work I had discovered that I didn’t like myself much at all. That I excused my limitations because I believed myself to be too weak, too fat, my belly too big and in the way–because once being over 210 lbs and wearing a size 20, I still believed to be that girl and I hated her. This reality of how I felt and saw myself was stopping me from moving forward, from seeing my potential, from growing in any way. I needed to face it head on, deal with it, bring everything to light no matter how painful if I was ever going to evolve further from where I was. The next Taylorism was given to me 4 months after my work began at a workshop in Dallas where I met even more amazing people. “You’ve GOT to get this…what are you waiting for? ?” I saw in Taylor a certainty he had about me that I was still not able to own myself. Weeks after, I worked and I worked and then there it was…guilt, shame, and so much ugliness that I was still holding onto, being in the dark, hiding decades of living with an eating disorder, so much self-hatred keeping me from owning true self-love, compassion, and self-acceptance. When I broke through, it all came to light and I’m finally shedding those layers…finally replacing hate with love, holding space of compassion and gratitude for myself where self-doubt and shame once lived. Yes, there most certainly is, and I’m going to have to open my heart even more to do so. Thank you, Taylor, from the bottom of my heart…for the light, for the practice as I know it today, for bringing us together, for helping us establish our community so we can continue to grow and share it with others. Join me THIS Saturday at 5 Points Local for an Ashtanga Yoga Method Workshop to find out!!! We’ll explore a bit of the history and the philosophy along with a deep dive into the method of Ashtanga Yoga. Broaden your understanding, deepen your own practice and enhance your overall experience of yoga. 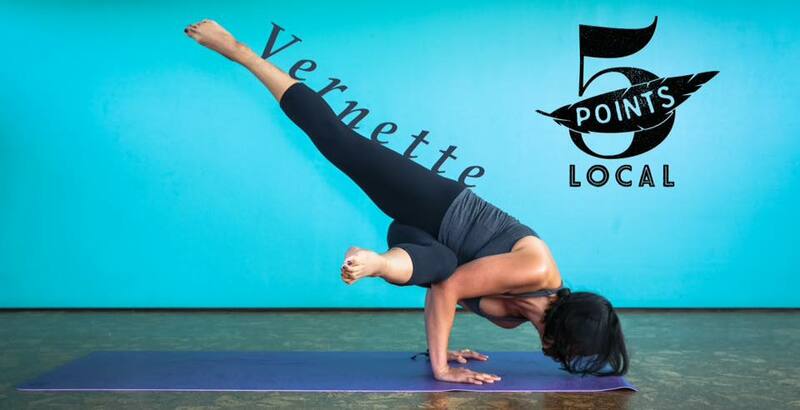 Register online today at 5pointslocal.com/yoga to secure your spot!!! We’re kicking off Full Primary Led at Hamsa School of Yoga and Ayurveda this Saturday, the 29th with the final installment of our Beginners Ashtanga Series from 9am – 11am…only $35 to join us!!! Beginning the following Saturday, May 6th from 8am to 930am, join V for Primary Led every weekend!!! Check out hamsayogaschool.com/classes for details. Private Sessions which may include Yoga, Pranayama (Breathing Exercises), Guided Meditation or general wellness consulting are available typically on Sundays. Contact me for availability or with any further questions or comments. Cheers to healthy living and I’ll see you on the mat!!! 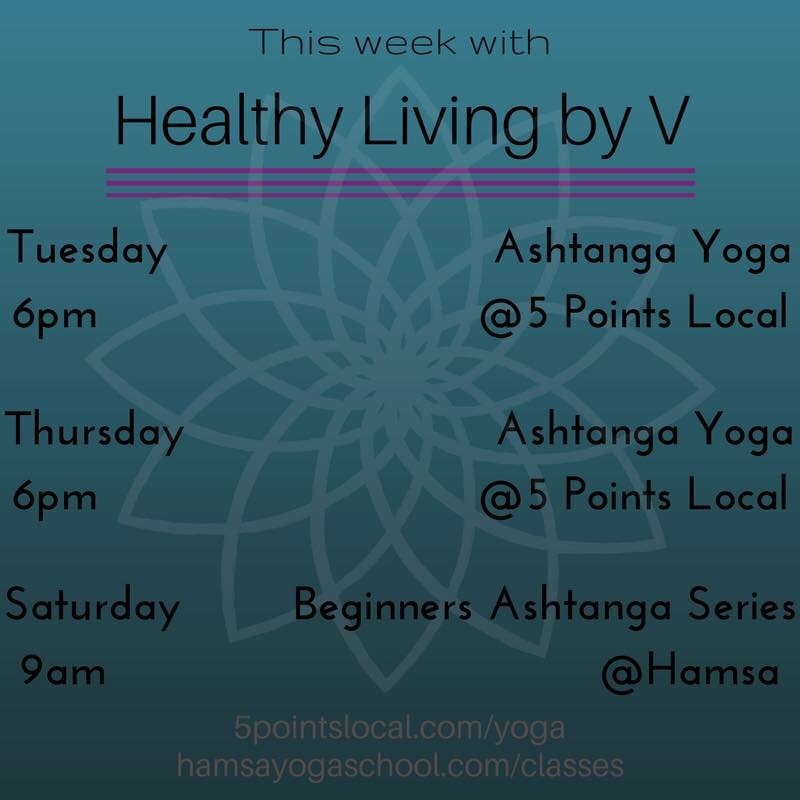 Ashtanga is coming to 5 Points Local! Join me on Tuesday nights beginning March 1st from 545p – 7p for Ashtanga – Modified Led Primary at 5 Points Local! Ashtanga is a traditional yoga practice which includes a set sequence of postures beginning with sun salutations to heat up the body followed by a series of standing postures, seated postures, back-bends and inversions. This beginner-friendly class is a modified version of the Primary Series in which students will be able to learn the fundamentals of Ashtanga and develop their own practice. All levels are welcome!